After yesterday’s game two loss to the University of Ottawa Gee-Gees in the nation’s capital, team captain Marie-Joëlle Allard said her team needed to play with a sense of urgency. They may have taken that message a bit too seriously, though. The team was playing aggressively and looked to have been pressing a bit too hard. They were called for five penalties over the first period and a half of the game. In a do-or-die situation, where any advantage could be crucial, the Gee-Gees were given every opportunity to grab the upper hand. That was until midway through the second period, when a tripping penalty was called on Ottawa defender Mélina Roy sent the Stingers on only their third power play of the game. For the first minute of the numerical advantage, the Stingers were having a hard time putting any good chances together. Related: The Stingers Drop Game Two in Ottawa. The Stingers looked frustrated by their inability to break through. 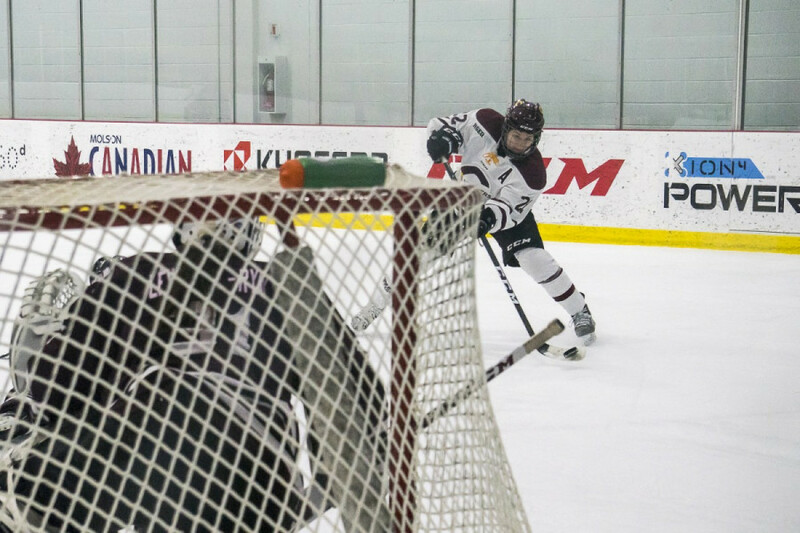 But one frantic scramble in front of the Gee-Gees net changed everything: A series of great saves by Ottawa goalie and yesterday’s hero Maude Lévesque-Ryan led to a loose puck in front of her net. Promptly, Allard buried it, giving her team the lead. Just a few minutes later, Lidia Fillion doubled her team’s lead with a weak shot that got past Lévesque-Ryan. After not being able to beat her yesterday in Ottawa, the Stingers had the Gee-Gees goaltender on her heels at Ed Meagher arena. On the other end, the Stingers were without their regular starting goalie Katherine Purchase. She was replaced by Alice Philbert, who was making her first start in the playoffs and earned four wins during the regular season. Philbert was having little trouble stopping the Gee-Gees’ pressure, which only mounted after the team went down by two goals. Still, the Ottawa pressure eventually managed to get to her. A series of rebounds landed on the stick of Taylor McGaughey, who buried it to cut the Gee-Gee deficit in half. Early in the final frame, Ottawa had gotten back in the game and were playing with the very same desperation that got them the win in game two. Luckily, the Stingers managed to stifle the late Gee-Gees’ offensive onslaught and win the game. They now move on to the next round, where they’ll face the Université de Montréal Carabins.